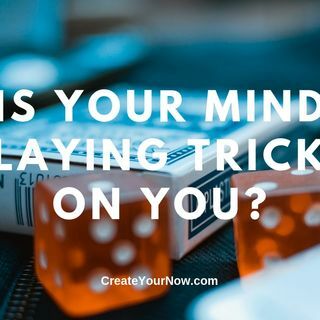 Is your mind playing tricks on you? Trying to get you to do, to think, and to say what you don't believe. Or do you? What we feed our mind produces the outcomes of our thoughts. Desire to be supported and encourage by other like-minded women? Join us at Women of IMPACT. http://facebook.com/groups/thewomenofimpact You can blame your mind for all the bad stuff, but it didn't put it there on its own. It's not by accident. At some point in your life, you fed your mind exactly what ... See More you think now. Some of it by your own choice, and others by your experiences and upbringing. All talk, no action leads to a life of dissatisfaction. However, now you are wiser and more astute. You know you have a choice in what you feed your mind in order to produce the outcomes you desire. So. Is your mind playing tricks on you? It most certainly can be, but not by your lack of knowledge. If you want to produce thoughts that move you forward, you have to be willing to do what you don't naturally do now. "Words are containers of power." ~ Joyce Meyer You create your now by what you say, how you say it, and the why in which you say it. Nothing can dig you out of the word dump except you! You must be willing to change your input to change your output. The K.I.S.S. ~ Change your input to change your output! You need to line up your mouth and the words you use with what you truly want to produce in your life. Keep saying all the junk stuff: I can't... I won't... Why should I... It never worked before because... Keep sleeping with the enemy: of fear of anger of hopelessness of the ego And what will all of that produce? You reap what you sow. (Galatians 6:7) But I have a deep-seeded feeling that you want more to life than what you are speaking. So instead of letting your mind play tricks on you, it's time to play your own game of thoughts with your own set of tricks. Speak what you want. If you want a positive attitude, then speak positive words. Focus on the right things, saying only the good things. There are right and wrong things in life. Instead of honing the skills of the wrong, look toward the skills of the right. Develop habits of greatness. What you do day in and day out matters. Don't take for granted and do whatever. Be present in how you live your moments. It's time to escape the excuses of just going through the motions. In each moment of your day, you have choices to make. Impact the world you touch by first impacting your own world. "Change your input, change your output. Change your life!" #MindsetMonday #CreateYourNow #PersonalDevelopment TAKE A.I.M. ~ Action Ignites Motivation - This is a complimentary (FREE) coaching call with me. You will be able to discuss your specific situation and gain tools and strategies to move you forward. Live. Love. IMPACT! "One step at a time leads to miles of greatness!" Subscribe to Create Your Now TV on YouTube. Wanting help with goals, setting your schedule, or need someone to talk to (even if you don't know what you need)? It's time you TAKE A.I.M. ~ Action Ignites Motivation. This is FREE for you. Stop trying to do it by yourself. Put YOU first! Become your best selfie so you can live your life's purpose. ANNOUNCEMENT: Ready to shine your light and tell your story. Please click on MY STRENGTH IS MY STORY. Here you can submit yourself to appear on the podcast or make recommendations as who you would like to hear. This is going to be a beautiful series! Subscribe to Create Your Now TV on YouTube. Listen to Create Your Now on Spotify. Listen to Create Your Now on iHeart Radio. Click here. The Create Your Now Archives are LIVE!! You can subscribe and listen to all the previous episodes here. http://bit.ly/CYNarchive1 and http://bit.ly/CYNarchive2 and http://bit.ly/CYNarchive3 and http://bit.ly/CYNarchive4 and http://bit.ly/CYNarchive5 Contact me at YourBestSelfie@CreateYourNow.com THE NO FUSS MEAL PLAN Instagram @CreateYourNow @Kristianne Wargo Twitter @KristianneWargo @CreateYourNow Facebook www.facebook.com/TheKISSCoach www.facebook.com/CreateYourNow PERISCOPE USERS!!! Click here for ANDROID Users / GOOGLE https://play.google.com/store/apps/details?id=tv.periscope.android Click here for APPLE Users https://itunes.apple.com/app/id972909677 Read more from Kristianne, a contributor to The Huffington Post, MindBodyGreen, Thrive Global, Addicted2Succes, and She Owns It. https://addicted2success.com/success-advice/5-things-to-do-while-waiting-for-success-to-manifest-in-your-life/ http://www.huffingtonpost.com/kristianne-wargo/ http://bit.ly/9amHabits https://journal.thriveglobal.com/how-to-configure-a-sleep-pattern-fit-for-you-d8edd3387eaf#.sniv275c3 https://sheownsit.com/when-failure-is-your-middle-name/ DOMESTIC BEAUTIES (Announcements) 1. Come and let's connect on Facebook - Women Of IMPACT http://facebook.com/groups/thewomenofimpact 2. Create Your Now ~ Your Best Selfie can be heard on iHeart Radio and Spotify! 3. Create Your Now Archive 1 is LIVE! You can subscribe and listen to all the previous episodes here. http://bit.ly/CYNarchive1 4. Create Your Now Archive 2 is LIVE! You can subscribe and listen to all the previous episodes here. http://bit.ly/CYNarchive2 5. Create Your Now Archive 3 is LIVE! You can subscribe and listen to all the previous episodes here. http://bit.ly/CYNarchive3 6. Create Your Now Archive 4 is LIVE! You can subscribe and listen to all the previous episodes here. http://bit.ly/CYNarchive4 7. Create Your Now Archive 5 is LIVE! You can subscribe and listen to all the previous episodes here. http://bit.ly/CYNarchive5 8. NEW Website! Go check it out and tell me what you think. http://www.createyournow.com 9. Sign Up for The A.I.M. Academy! You will be the first to learn all about it. http://createyournow.com/m-academy-2 10. Schedule a Discovery Call. This is a free 30-45 minute call for those serious about coaching with me. 11. Newsletter and Library: If you desire to get weekly emails, be sure to sign up here so you can stay connected. http://createyournow.com/library Cover Art by Jenny Hamson Photo by Josh Appel on Unsplash Music by Mandisa - Overcomer http://www.mandisaofficial.com Song ID: 68209 Song Title: Overcomer Writer(s): Ben Glover, Chris Stevens, David Garcia Copyright © 2013 Meaux Mercy (BMI) Moody Producer Music (BMI) 9t One Songs (ASCAP) Ariose Music (ASCAP) Universal Music - Brentwood Benson Publ. (ASCAP) D Soul Music (ASCAP) (adm. at CapitolCMGPublishing.com) All rights reserved. Used by permission.